Explanation: Sometimes you just have to stop and watch the meteors. 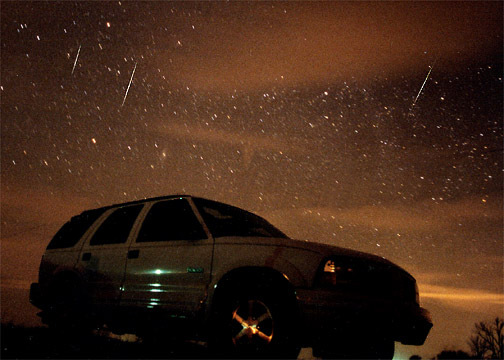 In the early morning hours of November 18, a band of eleven people searched for a flat and cloudless site to see the 2001 Leonids Meteor Shower. Starting in central Iowa, weather satellite images indicated that southern Minnesota might be their best chance, and so off they drove. Although they couldn't shake off all of the clouds, they found a dark gravel road, pulled off, and settled in for the rare celestial light show. "By about 4 am, we were visually counting 1000 per hour. After that they started to increase dramatically." The photographer was just a little too late to catch a really bright fireball, but did catch several other bright Leonid meteors above one of the cars in the convoy. The exposure lasted a few minutes. News: APOD is now also available in Spanish.